As the dramatic tram crash storyline plays out this week on ITV, celebrating the half-century that this highly regarded soap has been on our screens and culminating in tonight's hour-long live episode, I was delighted to see that ITV hadn't forgotten the serial's roots. Sandwiched between the two opening episodes of ITV's week-long 'disaster-thon' on Monday was a rare treat. The very first episode of Coronation Street, originally transmitted on the 9th December 1960, is likely the only full episode to make it out of the archives onto our screens but it was at least spruced up for its outing on Monday night and the version screened had been rather beautifully restored. Coronation Street, the creation of Salford born Tony Warren, appeared just as the so-called 'angry young men', the disaffected playwrights of the 1950s such as Osborne, Pinter, Wesker, Bond and Braine, had radicalised post-war theatre and Karel Reisz had ushered in the more socially conscious, kitchen sink drama of Saturday Night, Sunday Morning. Reisz's film, reflecting the Free Cinema of the period, the French New Wave, sparked an intense period of British film-making that was fixated with the North of England, its streets, its accents, its attitudes, its sense of community. As the 1960s progressed, the regional variations of England's many communities would be reflected on our screens, be they of the cinema or television. 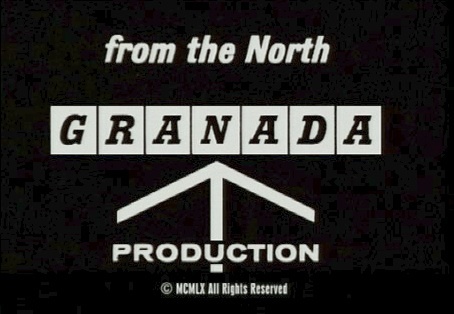 Coronation Street didn't follow in the wake of this trend, it helped to create it and continued to carry a torch for the depiction of working class regionalism for decades, promoting a naturalism in character and performance, what may now be seen as the cliche of a working class reality often enshrined in its humour, that clearly influenced other dramas, other soaps. In the first episode the broad musicality of the Lancashire and Mancunian accents really does stand out compared to some of the accents that abound in the soap today. 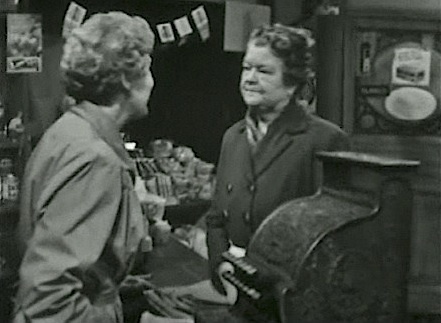 There's that lovely opening scene where Florrie Lindley is nervously accepting the advice of Elsie Lappin as she prepares to handover the running of the corner shop. The corner shop, like the Rovers and the Glad Tidings Mission, is as much a community space as it is a place of commerce. 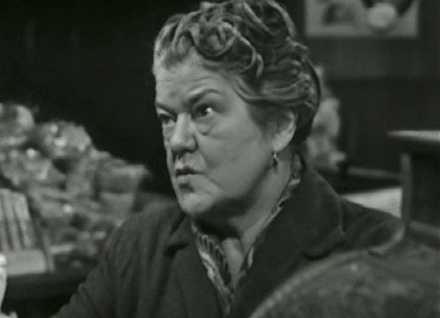 Florrie's first encounter with the demonic Ena Sharples (a wonderfully brittle and icy Violet Carson) is a case in point. While Ena superficially comes into the shop to make some purchases, she is all the while on a personal mission to get the measure of Florrie and her religious beliefs, her class. The shopping list of "a packet of baking powder, a bottle of bleach and a half dozen of them fancies. I said, no e-clairs!" punctuates a barrage of questions about Florrie's status as a widow and her origins in Esmerelda Street - "Very bay window down there, you'll find it different round here!' - and a warning about her neighbours, the Tanners that suggests Florrie has lowered her sights by taking up her occupation in a very working class street. The mobility between classes is nowhere better depicted in the young Ken Barlow's aspirations to better himself at University much to the bafflement of his father. This is expressed in the sniping between father and son at the dinner table as Ken rather disdainfully observes his father smothering his chops with brown sauce. They later have an argument about Ken's desire to go out and meet a girl at the Imperial Hotel, the place where his own mother works in the kitchens. Frank Barlow is outraged that the money he and his wife earn is now going to be ploughed back into the very place that employs one of them. Frank is certainly very prickly about his working class pride and the early episodes are a microcosm of the inter-generational conflicts that Britain itself was waking up to as the 1960s progessed, best epitomised in the later clash over Ken's participation in a 'ban-the-bomb' march. Ida Barlow, yet another of Warren's very strong female characters, is constantly playing devil's advocate between the two men, quietly getting each of them to see that their divisive attitudes will get them nowhere. 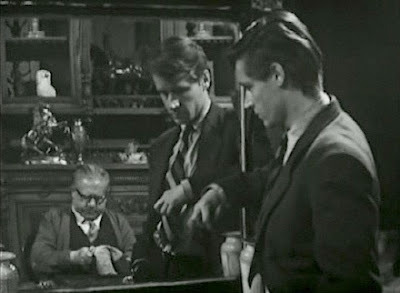 The generational disparities between men is highlighted further when Ken slopes off to see Albert Tatlock and bemoans the fact that he is forbidden to go out and see his girl, Susan. When Albert suggests Ken bring Susan back to Coronation Street, Ken clearly looks down on his origins. Albert makes no bones about telling him that he has turned into "a proper stuck up little snob." Before Ken can protest, he hears from his mother that Susan has already turned up at the house. His potential embarrassment has been well and truly exacerbated when Ken observes that she has already bonded with Frank and his brother David as she helps them repair a bicycle in the front room. Ken's still trying to get over it to this day. 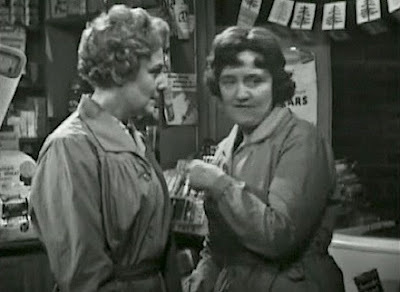 Ena's warning to Florrie about the Tanners is perhaps well founded. As the episode progresses we learn that Elsie Tanner's young son Dennis Tanner is fresh out of Borstal and her daughter Linda has left her husband. There is the obvious gulf between Ken and Dennis - one a delinquent who struggles to find work and his place in society and the other a privileged student supported by two hard working parents - and wonderfully illustrated in that brief scene with Annie Walker in the Rovers where she scolds Ken for his generosity towards Dennis. Annie simply doesn't believe 'them' and 'us' should mix. The episode informs us that Elsie is also separated from her husband, casting her as almost the equivalent of a 'fallen woman', especially in the eyes of Ena. 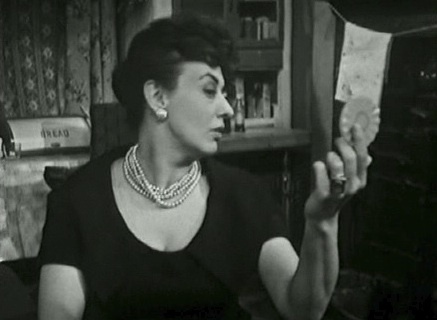 Elsie is yet another iconic female character, brilliantly played by Pat Phoenix, and sums up her own feelings, her attempt to cling on to what looks, dignity and pride she has left, by looking in her compact mirror and uttering to herself, "Eee, Elsie. You're just about ready fer knacker yard." There is a constant flux in the first episode of people either acting below or above their station in life and those that aspire to be better than their neighbours being told in no uncertain terms where they belong. The Rovers, like the corner shop, is the centre of the drama and where all classes and sexes meet but are still segregated. 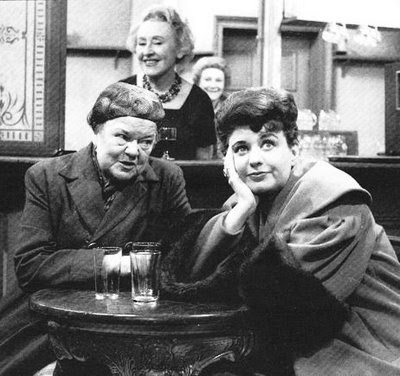 You either end up in the snug with the three witches - gossiping Ena and her hangers-on Minnie Caldwell and Martha Longhust (the fantastic Lynne Carrol who would often steal the show in many of these early episodes) - or in the public bar with the dart throwers and domino players. What emerges is Warren's stunning ability to pick up on the minutiae of Northern life and its characteristic speech patterns, allegedly observed and overheard from beneath his Auntie's dining table, and his sympathetic emphasis on female characters. Character, humour and people going about their lives are the trademarks of the early years of Coronation Street and it's only until the late 1960s that the producers and writers start to use more sensationalist storylines, ushered in by the viaduct collapse in 1967 and now repeated uncannily in this week's tram crash. What struck me this week, watching Coronation Street in the 21st Century after having abandoned it in the late 1980s, is that the episode leading up to the crash before the re-screening of this vintage opener from 1960 epitomised pretty much everything I don't like about soaps - terrible acting, poor scripts and a dependency on storylines that are simply about who is sleeping with whom. The tram crash itself was superbly done and subsequent episodes have been quite gripping but how long before the series returns to further rounds of inane squabbling and over the top soap villainy? Soaps by nature are, as Tony Warren says, "a stylised reality" but I think I prefer the style and the reality of the Street in 1960 where Warren's writing sings off the page and he delivers an acute view of class differences, generational conflict, the roles of men and women and chronicles the sloughing off of the austerity of the 1950s and pre-war deference. I'm sure the latest incarnation of the soap marches on confidently in its determination to reflect the social mores of our times but I often think it's sacrificed something of its soul in order to achieve it.